Actually this recipe is inspired by a chicken adobo from Laguna which my wife tasted when she went to her cousins there. The version of chicken adobo from Laguna was very spicy but absolutely delicious! With a little experimentation my wife made her version less spicy and the taste was, I think is more tasty because we used Coconut brand soy sauce and we use the tastiest part of the chicken, which is the whole back part instead of legs, thigh or wings. Those are sold cheaper as soup pack. 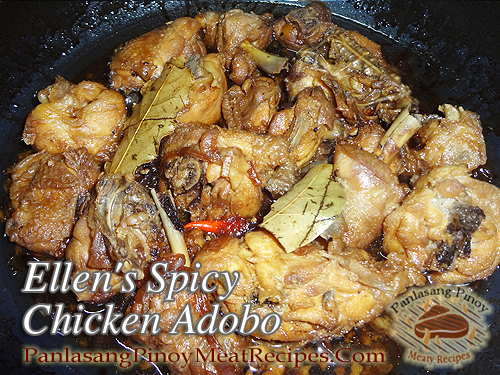 To cook Ellen’s spicy chicken adobo; Saute minced garlic in cooking oil until brown. Then add the onions and stir fry until soft. Add the chili peppers and also stir fry and crush it using the spatula during sauteing. The add the chopped tomatoes and saute for 3 minutes and the cover and simmer for 5 minutes until the tomatoes are soft. Then uncover and saute again and check if the tomatoes are very soft and add a little water if the tomatoes are too dry. Add the chopped chicken and stir constantly until the tomatoes are mixed with the chicken thoroughly. Then add the vinegar, soy sauce, bay leaf, sugar and seasoning granules. Cover and simmer for 30 minutes or more until the chicken is almost dark golden brown and the liquid has evaporated and only the oil is boiling with the chicken. Saute minced garlic in cooking oil until brown. Then add the onions and stir fry until soft. Add the chili peppers and also stir fry and crush it using the spatula during sauteing. The add the chopped tomatoes and saute for 3 minutes and the cover and simmer for 5 minutes until the tomatoes are soft. Then uncover and saute again and check if the tomatoes are very soft and add a little water if the tomatoes are too dry. Add the chopped chicken and stir constantly until the tomatoes are mixed with the chicken thoroughly. Then add the vinegar, soy sauce, bay leaf, sugar and seasoning granules. Cover and simmer for 30 minutes or more until the chicken is almost dark golden brown and the liquid has evaporated and only the oil is boiling with the chicken. Hi sir! I’ve tried to cook this and my family went crazy over it. Now every time that we’re gonna be together they keep on requesting me to cook it. Hi Kendrick, thanks for sharing your cooking experience!